In London, Lauren has the perfect life, a loving husband about to turn Forty and a stroppy teenager on the brink of something brilliant. Lauren chooses to ignore her husband’s odd behaviour and her daughter’s sullenness whilst she plans the perfect birthday party for her husband. Across the pond in Martha’s Vineyard, Lauren’s sister Jenna also has a seemingly perfect life. She has the perfect husband, her dream job and thinks she might be pregnant. Jenna and her husband are desperate to have a child, but unfortunately it’s not happening for them. Nancy, their Mother hasn’t been the same since the death of her husband and their Father, Tom. But to hear that she wants to sell the family home is a shock to the sisters. But not as much of a shock as the event that turns their life’s upside down and sees them back together in Martha’s Vineyard for the first time in years. Lauren’s reasons for not staying longer on her annual summer visits to Martha’s have been vague. But Mackenzie (Mack) her daughter is certain she knows the real reason they’ve never stayed particularly long. I don’t want to say too much more as I’d give too much away, but this is a beautifully written novel. I’d never read a Sarah Morgan novel before this one, so I’m off now to discover some of her back catalogue! 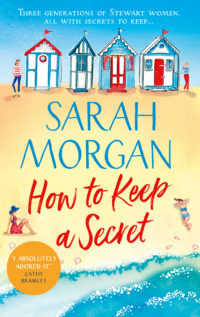 How to keep a secret is available from 14 June 2018. Thank You to lovereading.co.uk and the publishers who sent me advanced copy of this novel in exchange for an honest review.